Our Cloud, LAN or USB biased Digital Menu Board solutions give you the ability to easily edit and change content as you need. 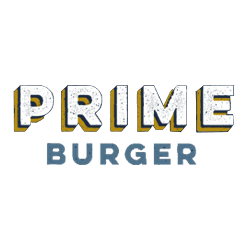 Cloud based menus can be updated from anywhere with an internet connection. 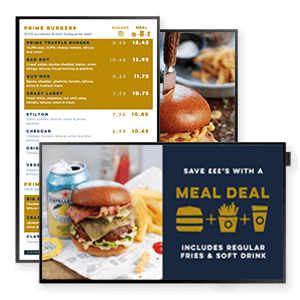 The menu boards not only get 400% More Views but can increase sales by up to 30%! Interactive options are available. EU Regulations now require allergy information to be shown with any food that is sold. Digital Allergy Information Boards make it easy, with the ability to update multiple screens with an Excel spreadsheet. Both Standard and Interactive (touch-screen) options are available. Create a seamless customer experience using Order and Collect Displays. 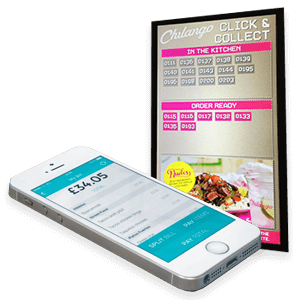 Display real-time orders on your Digital Signage, via the Flypay mobile ordering app. No need to let customers wait for food! 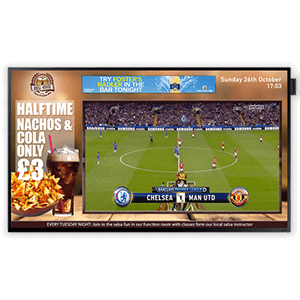 Our all-in-one Live TV & Advertising solution is perfect for restaurants, pubs and bars that show live TV through a Set Top Box with a HDMI, DVI or VGA output. Display marketing material alongside your live TV to push those extra sales, offer special promotions and claim advertising revenue. 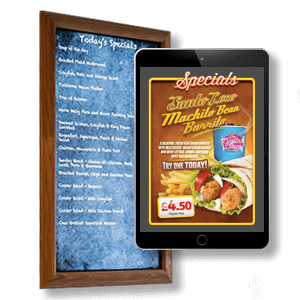 Our Digital Specials Boards solution make updating your daily specials easy and efficient. 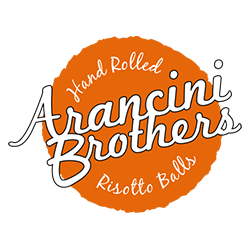 They specials boards can be updated with simply editing and uploading an excel spreadsheet. 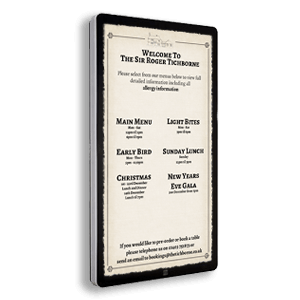 The embed signage software supports multiple devices meaning you can displays your menus on devices such as iPads. When one display isn’t big enough, make an impact with our commercial grade video wall solution. 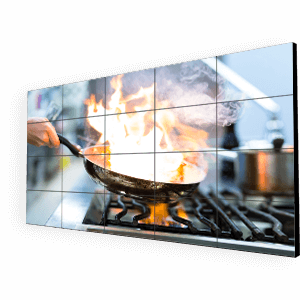 Potentially a large number of commercial grade, narrow bezel displays or tiles can be combined to create you the ultimate video wall. Interested?